There was an error in my last month’s article, though not when I wrote it! I commented on the lovely stand of tansy at Alvechurch station, which would flower well into September. Unfortunately they forgot they are not supposed to mow that bank until the flowers have finished, so it was all cut down. I hope it comes back. Tansy is a lovely old herb that used to be quite common round Alvechurch, but hardly any is left now as it doesn’t survive well if mown down in flower. Some flowers don’t mind: daisy, self-heal, silverweed and cats-ear are examples of plants that come back again and again in mown grass. Flowering plants do benefit from being mown, but just once, in the autumn or winter, when the flowers are over and the seeds fallen. It’s an odd autumn for fruits. Some trees, including crab-apples, are absolutely loaded, while some seem not to have fruited well at all. Blackthorn (sloe) is very variable. The bigger oak trees I have seen haven’t got many acorns this year, but sweet and horse chestnuts look to be doing well, and beech is full of mast. In my garden I have plums, damsons and apples galore. Elderflower and guelder rose did well, and hawthorn as always is full of red berries. There has been a lot of discussion in recent years about the concept of “re-wilding.” Most of the controversy is about the idea of re-introducing predators like lynx and wolves to our countryside. But it is about something much more fundamental than that. It is much more about re-establishing a “wild” habitat so that a wide range of species can thrive, including things like pine martens, wildcats and dormice, which almost disappeared here. It’s about restoring the balance of plants, fungi and even bacteria that makes soil healthy, managing flooding, and producing the right carbon balance for us. But what does “wildlife” mean? It presumably means plants and animals that would thrive in our country if we didn’t interfere. Of course, we are here, and we do intervene. We have been farming for 5,000 years, as well as extracting fuel and minerals and fishing the waters, and before that we hunted and gathered. Many of the plant species we are familiar with, we introduced over the centuries. Trees like sweet chestnuts, horse chestnuts and sycamores are notable examples, as are many culinary herbs. Rabbits were introduced by the medieval French (there is no Anglo-Saxon word for them) for food, and then attempts were made to wipe them out in the 20th century. Grey squirrels were brought in and nearly drove out the reds. At some point, someone thought it a good idea to bring in Japanese knotweed, Indian balsam and giant hogweed, along with many less problematic garden plants which naturalise in the wild. 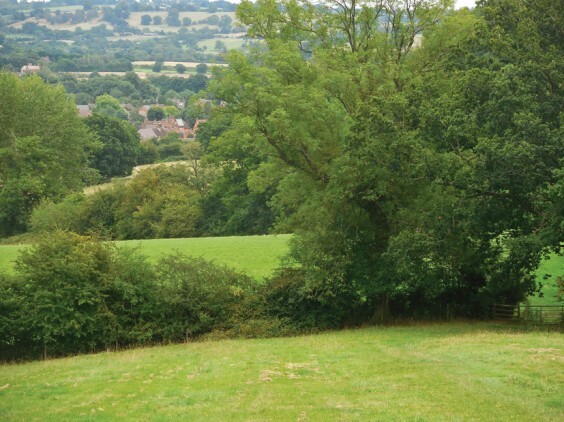 Even without these introductions, we have had a huge influence over the countryside. Although we have wild plants and animals, the countryside is not a wild habitat. A good example of this is our much loved farmland plants, insects and birds. When we think of wild flowers, there are two main habitats in our minds. One is the traditional hay meadow, where the perennial plants are cut once a year. These give us orchids, bugle, moon daisies, vetches, trefoils, knapweed and many other flowers. The other is the traditional cornfield, with its annual poppies, cornflowers, corn-marigolds and corn-cockles. These depend on the ground being ploughed each year. Neither of these habitats is usual in modern farming, but they survive because of conservation farming. But they are human-made habitats. So is the patchwork of hedges with all their flowering and fruiting trees, created by enclosures in relatively modern times. Geologists have just agreed internationally that we have entered a new age, the Anthropocene. The decision means that it’s accepted that human beings have now had such a profound influence on the planet that the nature of its basic systems has changed. In this part of the country the “natural” landscape would be woodland. Look down from any nearby hill and you can see how it used to be forest. There would be spring flowers, but after the trees were in full leaf there wouldn’t be any ground flowers. Human intervention, with fields and grazing replacing some of the woodland, actually enriched the habitat for native flowers, and their bees, butterflies and birds. But woodland wildlife has decreased over the centuries. It is possible to imagine what would happen if we all left, together with our domestic and farm animals. First of all, tough plants like nettles, brambles, docks and thistles would start to dominate. They are really good for insects and birds as well as small mammals, so wildlife would thrive. Birds would do well without our cats. However, we might lose some of our flowers which can’t compete with the tough ones unless the land is grazed or cut annually. As the land became less fertile, nettles would probably disappear again and a more varied flora may come for a time. Soon, though, small native trees would start to colonise the land. Hawthorn, alder, hazel, birch, ash and oak would all self-seed from nearby woods and hedges. Scrubland is the natural way our landscape regenerates itself. You can see small-scale examples of this anywhere land has been left ungrazed and undeveloped for many years. There is a great example on the edge of Alvechurch: the stretch of land between the dead arm and main canal. People don’t like it much, because it is untidy and not pretty, but it is thriving and full of wildlife. It always has bees and butterflies, and some relatively unusual birds like willow warblers (and great blackberries!). Scrub doesn’t stay, though, not in places like this. The trees grow and it will soon become proper woodland. Other trees will join the quick starters, and much of the plant life underneath will go. This happens surprisingly quickly, certainly within a lifetime. Most flowering plants can’t thrive in the full shade of trees. If you are near older woodland, you might get woodland species spreading in, like bluebells, woodruff and yellow archangel, which flower in spring. But if the wood was not managed by humans it might well have a dense understorey of brambles and not much else. Of course, this isn’t necessarily what our landscape was all like before we altered it. In most places there would have been wild grazing animals, which kept some scrubland from developing and created patches of more open grassy landscape. But we don’t have wild cattle, goats or horses in Britain any more. We do have deer, and without any control over them they would graze out stretches of countryside. So here we might have open grasslands, which would have some of our familiar wildflowers, birds and animals that don’t live in woodland. Rabbits and the foxes that eat them would like this, as would birds of prey looking for small mammals. And in a really wild environment, there would have been some higher-level predators on the grazing animals too. That’s why people talk of re-introducing lynx and wolves, so that the native deer and any other grazing animal populations would be kept under control. All of this is an imagined re-wilding; what would happen without us. But we are here, and we aren’t likely to go. Some re-wilding enthusiasts suggest we stop farming our uplands, which don’t provide very easy farming conditions, and allow them to re-wild. Areas like the Lake District and much of Scotland would thus become more like wildernesses, which we could visit for our enjoyment and would enable wildlife to thrive. Personally I don’t like this model, not just because I would miss the sheep-grazed uplands. It seems to be based on the idea that we can let parts of our countryside become tourist wildlife parks and concentrate our human economic activity elsewhere. I prefer a model where areas of wildlife conservation are also lived on and in by people who can make a living from farming and extraction. This is the way our British National Parks were established. They are not fenced round, open to anyone, farmed and quarried and lived in by all sorts of people, but with rules about how they could be developed. In some countries wildlife parks have gates and are not lived in except by their staff and tourists. In those kind of parks you can have high-level predatory animals. You can’t really have them where people are farming. I do think some re-wilding has a place, though. You can see it best where our uplands have been over-grazed by sheep and deer, or where huge conifer forests were planted to the detriment of other wildlife. In parts of Scotland, such as Coigach, they have stopped grazing on some uplands and replanted native Caledonian pines. Nearer home, Newbourne Wood in Rowney Green is being restored to native woodland following the removal of alien conifers. But they generally don’t use true re-wilding, which would mean letting native self-sown trees establish themselves as scrubland and then woodland. Instead they plant saplings after clearing the ground. Far from re-wilding, on many nature reserves scrubland is removed so that rarer habitats like heathland can survive or be re-established. Nearly all our nature reserves are maintained by human intervention, like grazing animals on it, as is most native woodland, for example by selective felling and understorey clearing. I suppose the truth is that over the millennia we have had profound effects on our landscape, producing both the diverse wildlife habitats we enjoy, and the barren places we don’t. Since we aren’t going to disappear, perhaps the best way to think ahead is to maximise our human-made habitats for wildlife. We also, though, have to make them useful for our economy – farming for food, producing energy and minerals, tourism and a home for all our other work. A really sustainable environment will have to do all these as well as support wildlife. Otherwise, we will be importing our energy and metals and even food from other countries (who will probably have to destroy their land and wildlife) while we enjoy a sort of giant leisure park which does not really support its inhabitants. This is at the heart of current discussions about the future of farming. There seems to be a polarisation between big economic farms that have destroyed so much of our wildlife over my lifetime, and smaller, environmentally-friendly farms that may not survive without subsidies. But it’s a false division. If we wanted to, we could have wildlife-friendly farms which also sustain us with food. We just have to decide how we want to make sure it happens, and how we pay for it. Farming has a huge impact for good or bad on our wildlife: 70 per cent of our land is farmed. We get very excited about fracking and HS2 and even wind turbines, but the way we farm has far more profound effects. Around here, human beings’ interventions into our countryside are generally positive for wildlife. Our pattern of small grazed fields with blossoming hedges, frequent copses and small woods, and the lovely edges of the canal, have created good habitat for plants, insects, birds and mammals, even though that wasn’t why they were developed! Sometimes we get it right by accident, so I hope we can continue on purpose. Here is a poem I wrote after a recent walk. Clear in the distance, reaching north. Salt in my eyes as I come to my earth. Pictured: Looking down Fox Hill.